If you're someone who has a knack for funky stationery, fun accessories or wall art, HappyEveryday has products that are a combination of aesthetics and utility – you'll go gaga over them. They've got customisable wooden diaries and journals (the covers are made of wood) in a range of designs – pick the ones with customisable quotes on them or go for the 'geo tiles' set that'll light up your Instagram; you also get a set of coasters with the latter. Think you're good at the classic Tic Tac Toe? 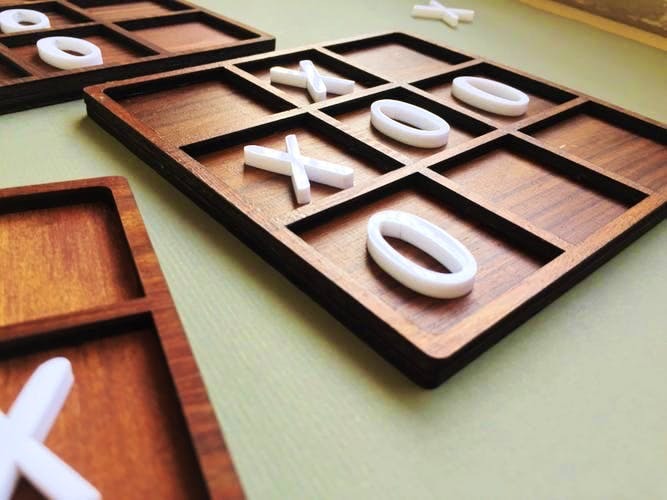 Doesn't matter even if you've got somewhat of a losing streak going – their Tic Tac Toe game on a veneer dark wood cutout will make the losses look pretty, too. It comes in a jute bag with 6 X's and O's each. Their personalised frames will definitely grab the attention no matter where you put them. Fitted with fairy lights and quotes (that you can customise) around the picture, this makes for one of the best gifting options when you're planning to go old school (with a twist). Got a lot of memories to store and the camera roll's just not cutting it anymore? These accordion albums will pop right into action. They open just like a harmonium or an accordion and has a bunch of space to put pictures in. We love the colourful, geometric designing on the covers! Their wall art game is pretty strong with these cutouts of symmetric lion heads and deer faces. Hang 'em up in any room of the house to up the style quotient.